Pigeons, of the homing variety, accomplished all of this and countless other amazing feats, during their long and storied service in the U.S. Army. Today, few people know about the heroism of these unassuming birds, or the integral role that Fort Monmouth played as the home of the Army's pigeon breeding and training center from 1917 to 1957. 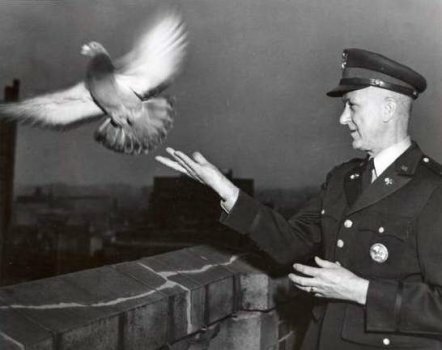 "Back in the day, these pigeons were rock stars," said independent filmmaker Alessandro Croseri, who is completing a series of three documentaries about the Army's "pigeoneers," including the late Col. Clifford A. Poutre, a legendary figure who led the Pigeon Service for many years. "And then, everyone forgot about them." the U.S. Army Signal Corps Pigeon Service, Fort Monmouth. In peacetime, thousands of people used to flock to the fort every year to see the pigeons. The star attractions included G.I. Joe, who saved a British brigade that was being bombarded by friendly fire in Italy in 1943, and Kaiser, a one-time German POW who later delivered messages for the Americans in World War I and went on to live to the ripe, old age of 32, twice the life span of an average pigeon. "He was a tough bird," marveled Croseri, 38, of New York City, who has bred and raced pigeons all his life. In an age where many people can scarcely recall how they ever managed before instant messaging and smart phones, it beggars belief that life and death, victory and defeat, and even the future of the free world once hinged on the success or failure of these delicate, winged messengers. But it's true. Since ancient times, humans have prized homing pigeons for their incredible ability to find their way back to their nests, even from hundreds of miles away. TheEgyptian pharaohs, Julius Caesar and the Crusaders and Saracens all used homing pigeons to deliver messages in battle. Even today, scientists have yet to figure out exactly how "homers," which look virtually the same as the pigeons that sit on park benches and roost under bridges, manage to navigate over such long distances, though it's believed that magnetic fields and the position of the sun are involved somehow. The results, however, speak for themselves. "They were about 99 percent perfect," boasted Edwin C. Schmidt, 94, of Elgin, Ill., a World War II pigeoneer who trained at Fort Monmouth. "Sometimes they would get through when you thought it wasn't possible at all." Even AT&T's iPhone 4, which drops more than 4 percent of its calls, can't match that record of reliability. 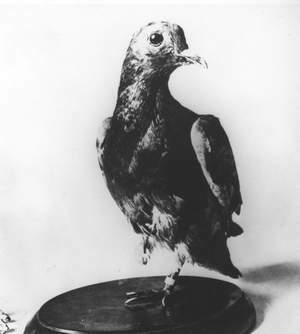 The U.S. Army first tried using pigeons in the 1870s during the Indian wars in the Dakotas. The experiment was a failure, on account of the large numbers of hawks that kept killing the birds, but by World War I, pigeons had become an invaluable military asset. Some birds even carried cameras that snapped photographs of enemy positions. Even in World War II, when radios and walkie-talkies were available, pigeons were used as an emergency means of communication. Paratroopers in the invasion of Normandy carried pigeons with them when they jumped deep behind German lines, in order to maintain radio silence. "They actually even used them in Korea," noted Lester Lane, a historian at the Army Signal Corps Regimental Museum at Fort Gordon, Ga. The basic method worked this way: A message was written on a small piece of paper that was rolled up and placed into a capsule attached to one of the pigeon's legs. Upon its release, the pigeon would head straight for its coop, which was located at the unit's headquarters or somewhere else behind the lines. The pigeon's nest functioned almost like an email in-box. When the bird returned, a buzzer would sound, indicating that a new message had arrived. There were some obvious drawbacks to using pigeons. For one thing, communication was strictly a one-way affair, meaning the pigeon couldn't fly back to the sender with a reply, though Croseri says in later years pigeoneers did experiment with a complicated two-way messaging system. Then there was the matter of the pigeon's survival. Opposing armies knew full well how crucial these messages were and did whatever they could to stop each other's pigeons from ever reaching their intended destination. Croseri says that in World War II, the Nazis used specially trained peregrine falcons to intercept Allied pigeons. Lane, the Signal Corps historian, says he's never been able to confirm the falcon story, though it's true that both sides used marksmen to shoot down the birds. "We shot their pigeons, and they shot ours," confirmed Schmidt. When the Army disbanded the Pigeon Service in 1957, the last 1,000 birds at Fort Monmouth were offered for sale to the general public. The more famous birds were parceled out to zoos. Hundreds of veterans and pigeon-racing enthusiasts descended on the fort in hopes of getting at least a few of the pigeons. A newspaper account says there was an overflow crowd of about 200 people who couldn't get in. 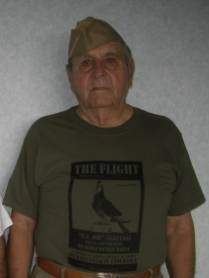 "I was about 15th or 18th in line," remembered Robert S. DeAdder, 96, who was an Signal Corps instructor at Fort Monmouth at the time and raced pigeons as a hobby. DeAdder, a former Shrewsbury resident who now lives in Severn, Md., wound up buying 10 pairs of birds, though, he said, "none of them did much for me." Today, the site of the pigeon training center is an empty lot off Oceanport Avenue on the fringes of the fort, which was shuttered in September. Gone, too, is the fort's museum, where several stuffed pigeons, including G.I. Joe, were kept on exhibit for many years. Lane, the historian, says he doesn't know what became of those pigeons. His museum houses the stuffed remains of a pigeon named Liles Boy, who flew 46 missions in Italy, the most of any pigeon in World War II. "There's no telling where those birds went," he said. Meanwhile, Croseri, a lifelong pigeon-racer, is hoping that his documentaries can raise greater awareness about this often-overlooked chapter of Army history. One day he'd like to see the story made into a feature film. "I love the birds, I love the pigeoneers, and I love the whole history," he said. "I thought it would be a shame for these stories to be buried with the pigeoneers." on the set last year of the documentary, "The Pigeoneers III"
Cher Ami: Flew 25 miles through enemy fire in 1918 to save a trapped American battalion despite losing an eye, being shot in the breast and having half its leg blown off. Awarded France's Croix de Guerre for valor. Kaiser: Captured from the Germany army by American troops in World War I; went on to fly numerous missions for the Allies and became a popular attraction at Fort Monmouth. After its death at age 32, it was stuffed and put on exhibit at the Smithsonian Institution. G.I. Joe: Flew 20 miles to deliver a message calling off the mistaken bombardment of a British regiment in Colvi Vecchia, Italy, in 1943. Yank: Delivered news of the fall of Gafsa in Tunisia in 1943; once carried an urgent note for Gen. George Patton 90 miles in 100 minutes. Chere Amie was awarded France's highest honor the Croix de Guerre after being shot down, losing a leg and still delivering the message. For more information on Pigeons In Combat, please visit: www.pigeonsincombat.com.